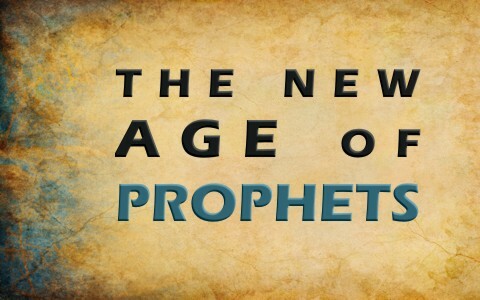 Today, there apparently is an explosion of new prophets and self-proclaimed apostles, so is this the new age of prophets? The word apostle comes from the Greek word “apostolos” and means “a delegate, messenger,” or “one sent forth with orders,” and that is just what we see when Jesus tells the apostles that “you will receive power when the Holy Spirit has come upon you, and you will be my witnesses in Jerusalem and in all Judea and Samaria, and to the end of the earth” (Acts 1:8), however, one of the Apostles had to be replaced, and of course that was Judas. The apostles reasoned that in order to find another apostle, he must have been “one of the men who have accompanied us during all the time that the Lord Jesus went in and out among us, beginning from the baptism of John until the day when he was taken up from us—one of these men must become with us a witness to his resurrection” (Acts 1:21-22). Notice that an apostle must have been “one of the men who have accompanied [the apostles] during all the time that the Lord Jesus went in and out among us,” and this includes the time, “beginning from the baptism of John until the day when he was taken up from us (Acts 1:9-11),” but also “one of these men” must also have been “a witness to his resurrection.” That would obviously eliminate anyone today from becoming an apostle. The Bible teaches that apostles are chosen by God, but in this case, the remaining 11 apostles did the choosing…so, where they wrong? Was Matthias really an apostle? Did God speak from heaven to tell them He had chosen Matthias? Didn’t Jesus tell them to go to Jerusalem and wait there until the Holy Spirit came (Acts 1:4-5)? Instead, the apostles cast lots and the lot fell to Matthias, however many Bible scholars believe the 12th apostle may have been the Apostle Paul, who was called directly by Jesus Christ, and who did see the resurrected Christ (Acts 9, and elsewhere), and perhaps, he had even seen some of Jesus’ earthly ministry, so he would have been qualified according to Acts 1:21-22. Regardless, it seems impossible for anyone to be an apostle today because they can’t be old enough to have seen Jesus during His earthly ministry. Just as no man has ever chosen himself to be an apostle; neither has any man chosen himself to be a prophet of God. In reality, when God called the prophets, they always resisted the call, just like Jeremiah who said, “Ah, Lord God! Behold, I do not know how to speak, for I am only a youth” (Jer 1:6), however the Lord God said, “Behold, I have put my words in your mouth” (Jer 1:9), so two points to consider are, God does the choosing of His prophets, and second, God will put His words in their mouth. They won’t be “God told me,” but “Thus says the Lord,” and self-proclaimed prophets have no such authority. For one thing, every prophecy ever uttered by a prophet was considered to be the Word of God and always came true, and some yet to be fulfilled, so it wasn’t the prophets words at all, but as God said, “I have put my words in your mouth” (Jer 1:9). A few years ago, a man came to visit our church, and after services he told me, “God has spoken to me and told me that you are to be a prophet and not a pastor.” He said, “In less than a year, you’ll be called by God into the new age of prophets and apostles,” and God had plans to send me around the world to help be part of the “new reformation.” That time has come and gone. He was wrong, therefore, according to the Bible, we need not hear him…he is not a true prophet of God. It’s not like baseball where you’re allowed 3 strikes. No, it’s once wrong, forever wrong. Apparently, false prophets were among the people of Moses’ day too, so the Lord commanded Moses, who himself was a prophet, to write, “the prophet who presumes to speak a word in my name that I have not commanded him to speak, or who speaks in the name of other gods, that same prophet shall die” (Deut 18:20). When I reminded this man, who believed he was an apostle, and whom claimed he spoke for God, that he’s not allowed to be wrong…even once! He was wrong, and I never saw him again. The Bible has a serious warning for those who self-anoint themselves as true prophets or apostles of God. Besides, there are only 12 pillars in the temple, right? In speaking with some of these “prophets/apostles,” I noticed there is rarely any humility and they are always right…about everything! I can’t say that! Anyway, they do seem to be full of themselves and will take correction from no one, so they appear to be resisting God (James 4:6). And even worse, some claim to have had visions or dreams from God that are apocalyptic in nature, but again, God warns those who have received either a lying spirit from the demons, or are lying just to receive the accolades of men or for financial reward, “that prophet or that dreamer of dreams shall be put to death, because he has taught rebellion against the LORD your God, who brought you out of the land of Egypt and redeemed you out of the house of slavery, to make you leave the way in which the LORD your God commanded you to walk. So you shall purge the evil from your midst” (Deut 13:5). If you can convince me from Scripture that God is still or will later choose more apostles or prophets, then I will change my mind…but for now, unless I am convinced by Scripture, I will not believe it…and even if they look like the angels of God, because I am reminded, not all that glitters is gold (2 Cor 11:14). Read more on this topic here: What Does the Bible Say About False Prophets? Have you ever been hurt by a person that claimed to be a prophet or an apostle? Hello Myron. I have been lied to and several failed prophecies given to me about me and each one of them were wrong. Previous post: What Are Some Myths About Pastors?